The quintessential summer side. 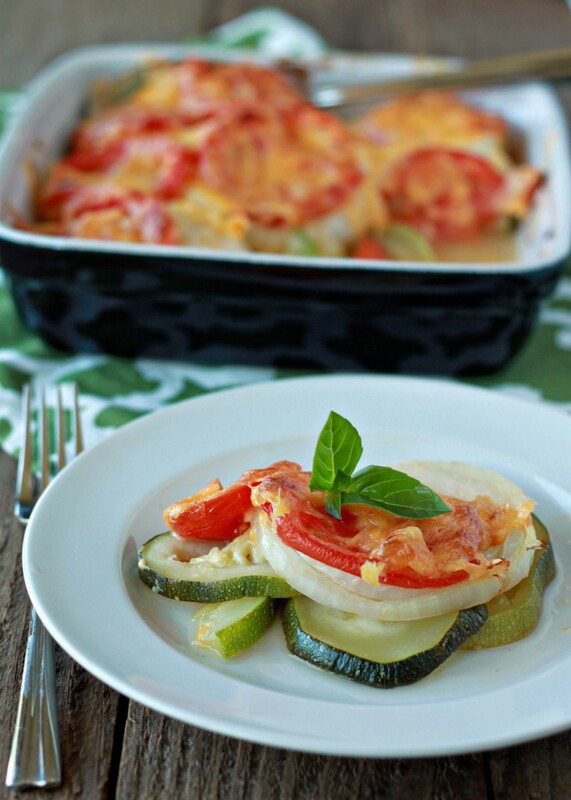 Fresh-from-the-garden zucchini, tomatoes, and onions layered and covered with cheddar, then baked until tender and cheesy. I grew up on this dish. Every summer, my mom would head out to the garden and bring in a huge zucchini and a couple of perfectly ripe tomatoes. She’d slice them up and throw them in a baking dish with some sweet onion, and then she’d top it all with a good amount of grated cheddar. Then she’d bake it until the veggies were tender, the cheddar oozey, the family happy. It seems like such a simple dish (and it is), but I’ve screwed it up an embarrassing number of times. Basically, the pattern goes like this: I forget important details from season to season, fail an attempt (bake it covered, for too long, not long enough …), and then I call my mom once again to ask for directions. So I’m actually kind of proud that I finally remembered it all on my own this year. And it’s just as I remembered: the dish my mom would whip up every other day come August, a sure sign that we’re smack in the middle of the dog days of summer. From time to time, I’ll make a vegan version by skipping the cheddar and drizzling the veggies with a tablespoon or so of olive oil, then dusting with salt and pepper and baking as usual. Also wonderful! Mozzarella Daiya is also great in lieu of cheddar, though I use it a bit more sparingly. 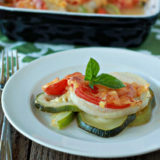 In an 8″ x 8″ baking dish, lay the zucchini, then the onions, then the tomatoes. Top with a pinch of salt and pepper, then sprinkle the cheddar cheese on top. Bake uncovered for 30 minutes, or until the vegetables are tender and the cheese melted. Okay…this is seriously SO perfect!! 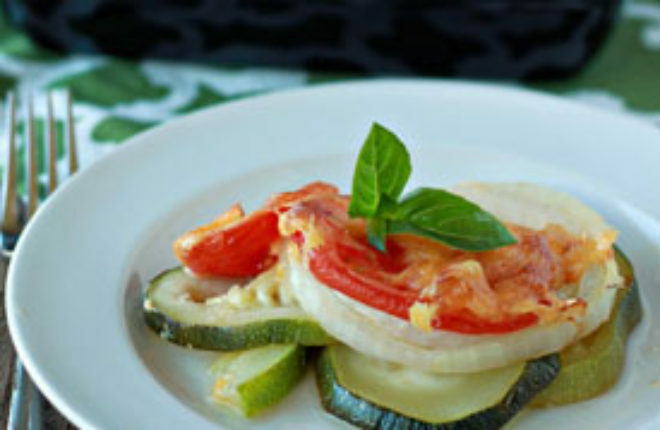 Now that zucchinis and tomatoes are pretty much amazing, I am always on the lookout for recipes to use them in. I REALLY want to try making a vegan version of this with Daiya! Daiya is the best vegan “cheese” that I have found! I think Mom’s love having their kids call and ask them for recipe directions! Maybe on purpose sometimes!!! 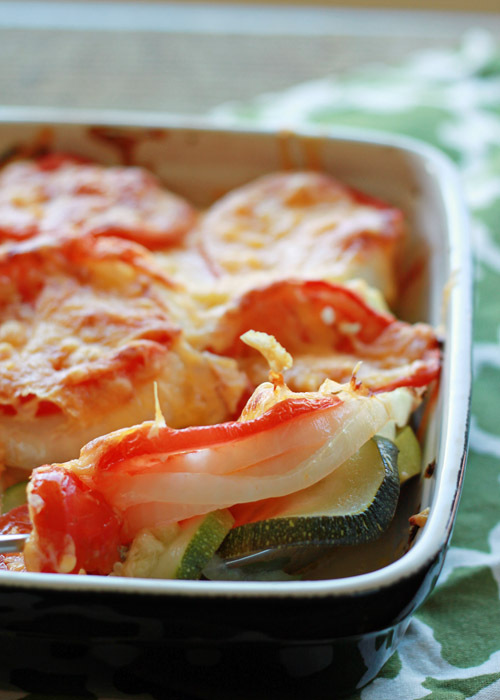 This looks so good – what is it about veggies topped with a little cheese?! I could eat BOWLS full!! This looks amazing. Yakima Fruit stand here I come so I can make this tonight! I did make it 2 nights in a row. So yummy! You consistently take the most beautiful food pictures I think I’ve ever seen! Just made this tonight for dinner with some rice. It made me realize how much I love cheddar cheese! I love that there aren’t many ingredients and I had everything on hand from the local farmer’s market! Thanks! Sometimes the simplest recipes are some of the best! Especially with fresh, local ingredients. 🙂 I’m glad you loved it (and yes, cheddar is a weakness of mine!) I have some monster zucchini brewing out in the garden so I’m thinking it’s time for another round of the stuff. Happy summer!